When I first saw the paper critiquing Jacobson's 100% renewables plan (see here, here, here, and here) I thought to myself, “If he denies there are any mistakes but then makes changes, I'll know that the critiques had at least some measure of validity.” Lo and behold, after denying that there were any mistakes, he immediately made revisions to the study. Why did Mark Jacobson limit his 100% renewable game plan to the expansion of wind and solar? In a nutshell, it’s because “we” environmentalists are opposed to practically every other energy source. Corn, palm, cane, and canola liquid biofuels, new dams, and the combustion of biomass have all more or less been rejected as being too environmentally destructive. But nuclear power does not necessitate the obliteration of river ecosystems, salmon runs, forests, or grasslands. Instead, environmental groups have rejected it on the pretense that it’s too expensive, dirty, and dangerous. And because none of that is necessarily true, one has to conclude that it’s being rejected out of willful ignorance (not unlike the rejection of the theory of evolution by some groups and for similar reasons). You might argue that Jacobson rejected nuclear energy because of its cost but when Jesse Jenkins mentioned in a tweet that Jacobson’s own data had (inadvertently) demonstrated that the inclusion of nuclear would actually have lowered costs, Jacobson’s response was to simply ban Jenkins from his twitter feed. The difference between Jacobson’s study and most others is the extraordinary claim to know how to decarbonize an entire industrialized planet via the expansion of only two (sporadic) energy sources: wind and solar. I don’t know at what point Jacobson went off the rails, but a research paper is just a road-map used to test hypothesis. Unless and until the results are vetted, the results of studies like these are only, at best, theoretical. In reality, hypothesis rarely pan out, in part or especially in full. His promotion of the study’s grandiose theoretical results as factual borders on the (pick a word for me). Papers tend to serve as stepping stones for later ones. They are rarely the be all end all solution. A study was recently published that looks a lot like Jacobson's except it fixed many of his problems with the inclusion of nuclear. Let me give you a simple real world example of a study I did to test the hypothesis that single story homes in Seattle can supply all of their own heating needs using a trickle-down solar collection system. 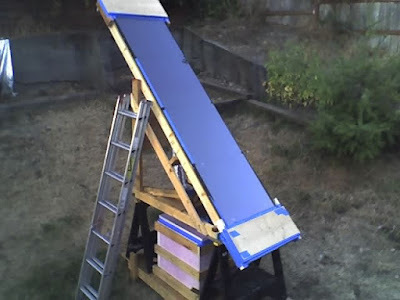 I'd read about these systems but couldn't find any data on them, so, to satisfy my curiosity, I generated my own data by constructing a test rig using a single piece of black corrugated metal roofing covered with glass. A pump circulated water to the top of the roof segment from a three cubic foot insulated container at the bottom. See Figure 1. The test confirmed that a system like this, on mild, partly cloudy days in Seattle could raise the water temperature from 70 degrees Fahrenheit to 110 degrees. Using that information and a whole lot of assumptions to fill in for missing data, I was able to calculate that it would be possible to store, during the summer, enough hot water in a well-insulated pool under a well-insulated single story house to meet its heating needs for a year in that part of the world using a south facing shed roof with the proper inclination etc, etc. How would the glass, inside and outside, as well as the corrugated metal under it be cleaned and by who? How do you prevent ground water from compromising the insulation around your underground storage pool? How much power would the pumps consume (can’t be solar powered because the roof is all used for heating water)? How would you secure the glass to resist wind, snow, and seismic loads? How long would it take before the water abrades a hole in the roofing? Who would repair leaks in the storage pool and how? What would the design of this storage pool look like? How do you control the water quality in the pool? How would the heat be retrieved? What would it all cost? Technological issues aside, how would you convince people to install this system, assuming you could get it to work and the necessary infrastructure to support it? Some neighborhood covenants require cedar shake roofing for its aesthetic appeal. Seattle zoning laws don't allow solar panels in front yards and on, and on. Now consider Jacobson’s claim to have calculated ways not to just heat homes in Seattle, but to power an entire planet with the expansion of just wind and solar. I came up with a short, very incomplete, list of ten unanswered questions for my study. Jacobson’s study would generate tens if not hundreds of thousands of them. Communism also looked good on paper in its heyday …doesn’t work. The NIMBY factor alone likely makes his plan untenable. However, if I were a renewable energy lobbyist or possibly an extreme left politician, Jacobson's plan would be just the ticket.